“Eat, Drink and be Merry, for Tomorrow We Die”? Here are fifteen articles that all point to the same sad-conclusion: World War III. In spite of the lies and propaganda, some of the BBC’s interlocutors on Saturday’s “Any Answers?” see through the layers of deception. A rare glimpse of truth emerged early in the program with two callers challenging the BBC and mainstream press narrative. One caller referred to Peter Ford, former ambassador to Syria, likening the British to a dog returning to its own vomit and regime change being the agenda for intervention in Syria. Clearly, not everyone is convinced that Assad and Putin are evil incarnate and sense a bigger plot afoot. Nobody described the bigger plot beyond the determination for regime change; reference was made to the chaos created previously in Iraq and Libya. These three countries (among others) were slated for invasion at least as far back as 2001 – why? Because all wars are banksters wars and the banksters want to recover their stranglehold on Russia and resources across the Middle East. Russia is clearly the prize and the Afghanistan scenario is repeating itself with US and its allies arming and supporting a terrorist army to embroil Russia in an intractable engagement. The CIA created “Al Qaeda” to weaken the Soviet Union in Afghanistan; the trick is repeated with the creation of ISIS out of the chaos in Iraq and Libya. Now the US is upping the ante. We used to wonder where war lived, what it was that made it so vile. And now we realize that we know where it lives…inside ourselves. 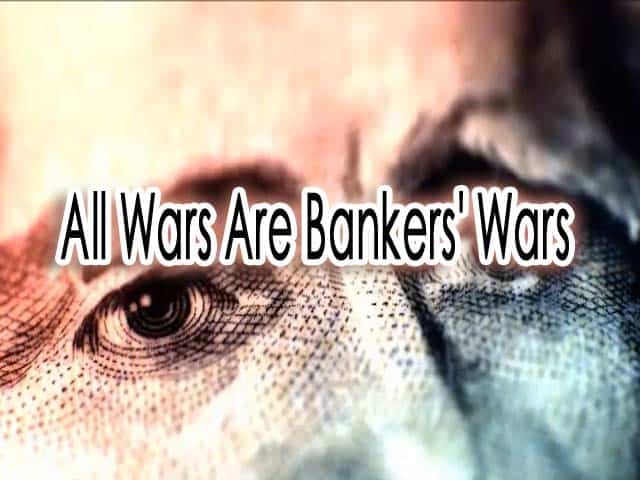 All wars are bankers wars – exactly. It’s been true since the Knights Templar. Absolutely, LT! I think most people are unaware of how old this corrupt system/order truly is. I’ve tried to stay away from posting too many articles on this subject (ww III), but it’s hard to ignore what is staring us in the face right now. This confrontation with Russia is far worse than it was a half century ago. The U.S. government wasn’t quite as insane then. I have read that Russia is warning others about our instability here in the US. We ARE unstable – we are over the top! No doubt about that, LT! We live in an asylum being run by lunatics!